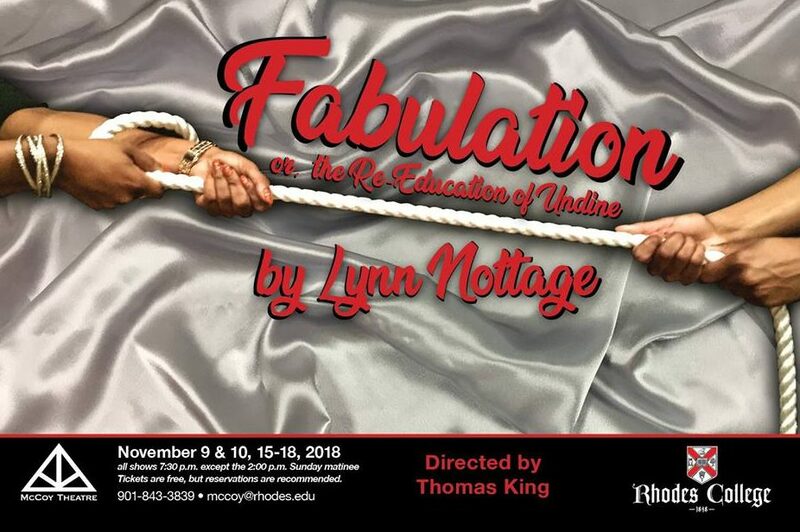 On Nov. 9 and 10 at 7:30 PM, Rhodes College has been preparing to perform Fabulation or, The Re-education of Undine complete with a reception at the McCoy Theater. Directed by Thomas King, the performance was written by Lynn Nottage, a professor at Columbia University and a Pulitzer-Prize winning playwright who specializes in Black theatrical performance with her complex characters. Coincidently, Southwest Community College has performed another piece by Dr. Nottage, Crumbs from the Table of Joy during October and the University of Memphis performed her Intimate Apparel the first days of November. The co-publicity has been great according to Collier, and there will also be a final event on Nov. 11 with all the three colleges performing highlights of their respective performances at the Dixon Gallery. For their 38th season, the McCoy Theater will make all public performances including Fabulation or, The Re-education of Undine free to both the Rhodes and greater Memphis community. While tickets are free, reservations are recommended by emailing mccoy@rhodes.edu or calling 901-643-3839. This performance has required actors (both those new to the stage and veterans of the craft) and stage technicians who is led by the Stage Manager and Assistant Director Andrea Hargrove ’19. While the actors had auditioned for their roles, the stage technicians use their lab hours from their class to help construct the set. The play will also be performed Nov.15-18 at 7:30 expect for Nov. 17 which will be at 2 PM.